Pop quiz time: What constitutes a good dog kidney diet? Is your answer “a”? If so, did you get that information from your vet? Or from some websites? For many years, the “standard” recommendation of a dog kidney diet from conventional vets has been a “low-protein” diet. You can of course find some such prescription diets sold in most vet clinics (e.g. Hill’s® k/d®). Usually, these prescription diets taste awful (ask any dogs on such diets and they will tell you so), and the ingredients used are far from being of “high quality” as the manufacturers claim to be. But the main issue here is, the idea that “dogs with kidney disease have to be on a low-protein diet” is in fact a myth. And that myth was actually busted way back in 1975 by Dr. David Kronfeld, a veterinary researcher at the University of Pennsylvania! According to Dr. Kronfeld, instead of feeding less protein, moderate amount of high-quality protein should be fed. A low protein dog kidney diet is not necessary. If your vet suggests a prescription low-protein diet, ask him why. Challenge him! Fact is, a low-protein diet can do more harm than good. Major organs (heart, kidneys, liver, lungs) need protein to survive and function optimally. If a dog doesn’t get enough protein from food, the dog’s body will have to break itself down to get the protein it requires. This is especially detrimental to older dogs because they actually need more protein (about 50 percent more) than younger dogs to maintain their protein level in the body. The reason is, older dogs are less capable of fully utilizing nutrients from foods. If older dogs are fed a low-protein diet, they will have weaker muscle tone, weaker and sub-optimal organ functions, less energy, and weaker immunity. But aren’t proteins high in phosphorus? 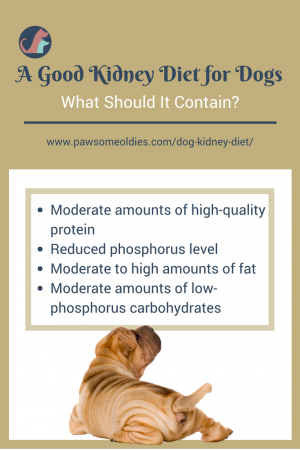 And isn’t phosphorus not good for dogs with kidney failure? You may ask. As mentioned above, prescription diets are TOTALLY unpalatable. They even smell awful! No wonder dogs – even those who eat everything and anything – turn their nose up when served such food. You really need to “force” them to eat the food! Finally, if you look at the ingredients used in such prescription dog kidney diet, you will find low-quality, species-inappropriate food items, such as brewer’s rice, beet pulp, sorghum, corn gluten meal, as well as non-specific food sources such as “chicken liver flavor”, “pork liver flavor”. Would you blame your dog if he wouldn’t even touch the food? 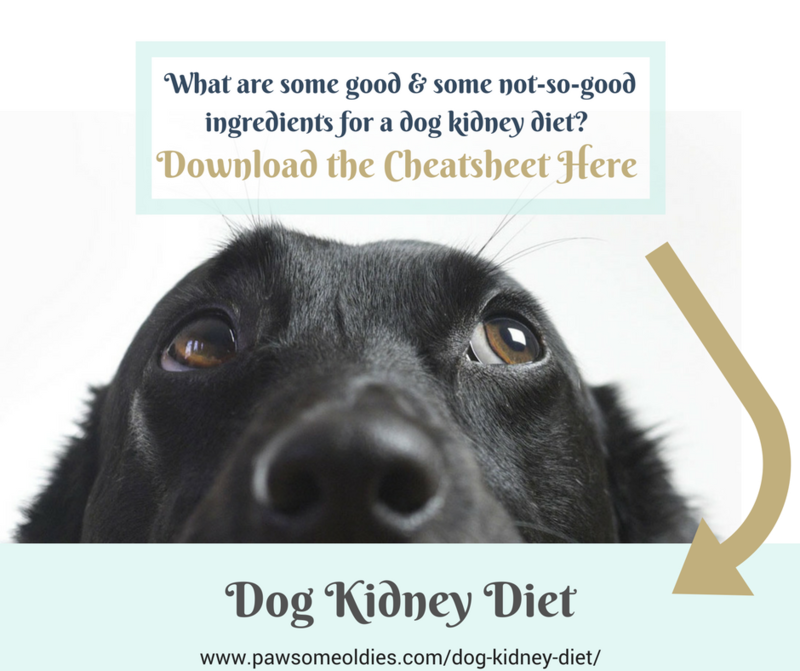 So, what makes an appropriate dog kidney diet? Lots of fresh clean water. If a dog has kidney disease, the suggestion is that the diet should contain moderate amounts of low-phosphorus high-quality protein. Animal protein is the most species-appropriate protein source for dogs. Avoid plant protein such as seeds, beans, nuts, and whole grains as they are high in phosphorus and of course not as species-appropriate for dogs. Lean meat (low fat) is higher in phosphorus than fatty meats, so as long as your dog is not prone to pancreatitis, feed higher-fat meats such as chicken dark meat and skin, pork, and 20%-fat ground beef. If your dog’s BUN level is over 80mg/dL, creatinine is over 3.0 mg/dL, and phosphorus level is elevated, he is considered “uremic”, then it’s time to reduce the level of phosphorus. (Uremia is a complication of kidney failure and uremic dogs show symptoms such as nausea, vomiting, lethargy, and ulcers). 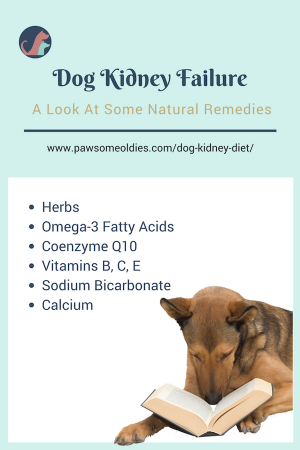 If your dog has early stage kidney failure, you may want to include just very small amounts of some of the above food items to his diet sometimes, for variety and for the nutrients they provide. But for dogs with advanced kidney disease (i.e. uremia has set in), I would avoid giving such foods completely. Reducing phosphorus in the diet does NOT help the kidneys get better. 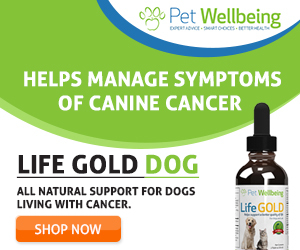 It only helps make a dog with advanced kidney failure feel more comfortable and in less pain, because failing kidneys have problem handling phosphorus and can cause pain and discomfort to the dog. Avoid vegetable oils, such as corn oil, canola oil, sunflower oil, and flax seed oil. Also avoid cod liver oil. Liver contains high levels of vitamin D, which is difficult for failing kidneys to process. Too much fat may cause pancreatitis in dogs. If your dog is prone to pancreatitis, feed moderate amount of fat. Also, start giving fat to your dog in smaller amounts and increase the portion progressively. If you start off by giving a lot of fat, your dog may develop diarrhea. As only moderate amounts of protein and fat are appropriate for dogs with kidney disease, a dog kidney diet can contain up to 40 percent of carbohydrates so the dog can get enough calories. Fruits low in phosphorus and are good for dogs include apples (be sure to remove the core and seeds), bananas, and berries. Grains that are low in phosphorus include barley, buckwheat and white sticky rice (the rice used to make sushi). Whole wheat, oatmeal, brown rice, millet, and other whole grains are rather high in phosphorus so avoid such carb sources. Have you started writing down all these food items yet? No? Good! As I have prepared a cheatsheet for you. Download it here. It is important that dogs with kidney failure drink lots of water, to prevent dehydration. Make sure your dog has access to fresh clean water 24/7. Avoid hard water as it contains minerals. Use filtered water instead. If your dog doesn’t drink enough water and is dehydrated, subcutaneous fluids should be given. There are in fact quite a few natural remedies and supplements that you can use to help your oldie if he has kidney failure. Herbs that are considered kidney tonics include nettle, dandelion, alfalfa, marshmallow, and couch grass. Chinese herbs such as Rehmannia root and Dong Quai are also beneficial. This natural herbal formula contains the herbs Rehmannia root, Dong Quai, Cordyceps (mushrooms), and Astragalus root. It not only supports kidney function but also enhances immunity. 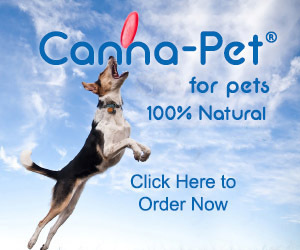 Co-Q 10 helps toxin elimination from the body and can boost a dog’s energy level. Recommended dosage is 15 mg per 25 pounds of body weight, 3 times a day. Dogs with kidney failure have to pee more often, and as such, water soluble vitamins like vitamins B-complex and C are eliminated together with the urine. Excessive urine also flushes out bicarbonate ions from the kidney tissue. The problem is, kidneys need bicarbonate ions to function properly. Fortunately, there is a simple way to replenish bicarbonate ions. Just add a pinch of baking soda to your dog’s food! Calcium is a phosphorus binder, so it can help decrease phosphorus levels and slow down the progression of kidney failure. Supplement your dog with calcium by giving around 1000 mg calcium per pound of food.